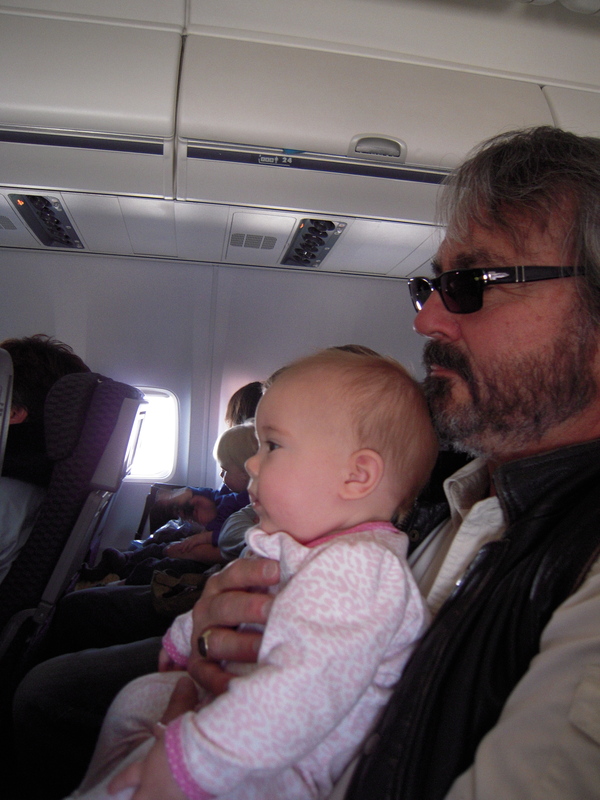 My niece Molly (5 months old) and my pops (slightly older) on the flight to California. Yes, they are both as cool as they look. Molly and Rowan both did remarkably well on the airplane. Even without having spiked their food with Benadryl (my suggestion). Dinner our first night in town was at a tasty Mediterranean restaurant. 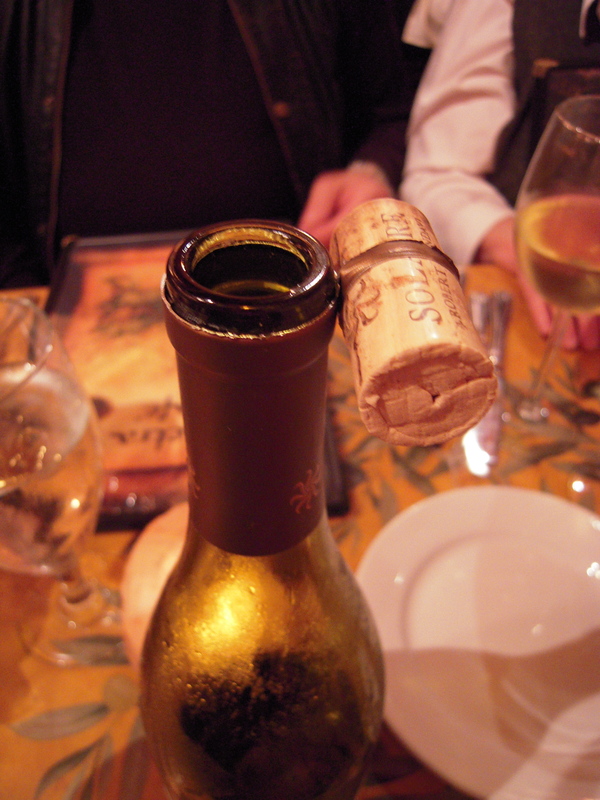 Check out the job the waiter did with the corkscrew, which he repeated on each of the bottles we drank. This is just one small example of the extreme attention to detail paid in this town, from the mailman (long white hair, jet black handlebar mustache that ended in twirls) to the hospitality (many restaurants feature specific seating areas for people with dogs). 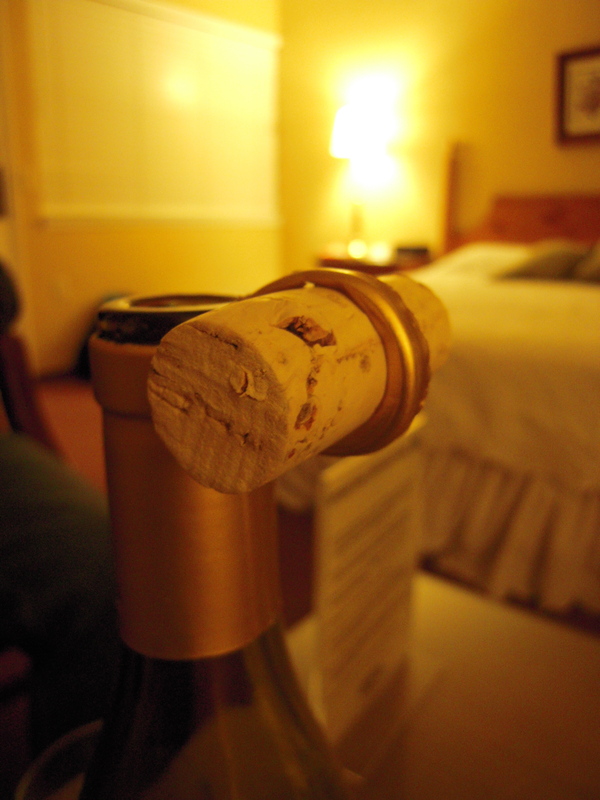 As soon as we got back to our room, I tried my hand at the cork-holder trick. Not as delicate as the work of the waiter, but it got the job done. 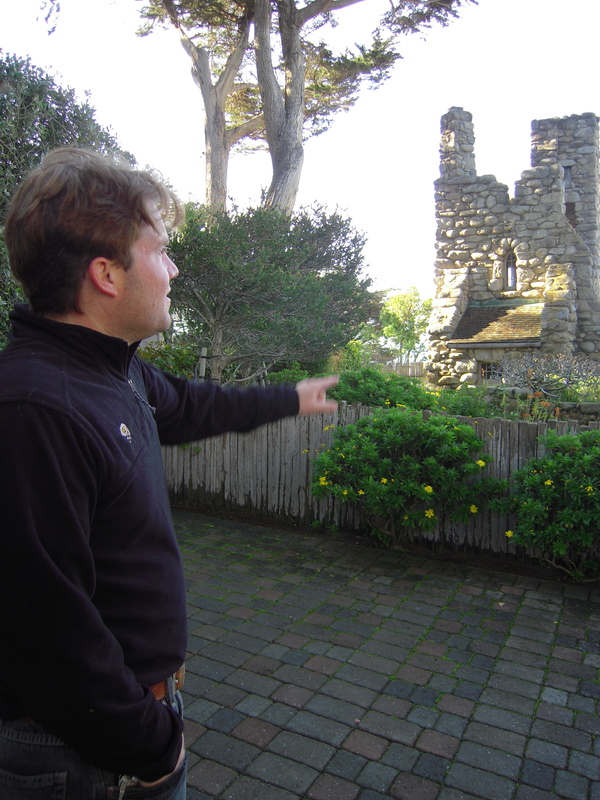 My brother outside of Tor House, the compound built by the poet Robinson Jeffers. They don't allow you to take pictures once inside the fence, so I'm sorry to not be able to share more detail with you. The building in the background is Hawk Tower, which Jeffers built for his wife. There's a "hidden" stairway inside the right half of the tower that you have to go up sideways because it's so narrow. Not good for the claustrophobic or big-assed among us. Of course I was worried I'd get stuck or freak out on my journey upward, so as always when I'm in a situation that makes me nervous, I giggled the entire way. The view from the back yard of Tor House. Funny story: my parents did the tour before us so they could then watch my brother's kids while the rest of us did the tour. When we arrived for our turn, the docent said that we were the one millionth visitor/reservation to Tor House and that our admission was free. 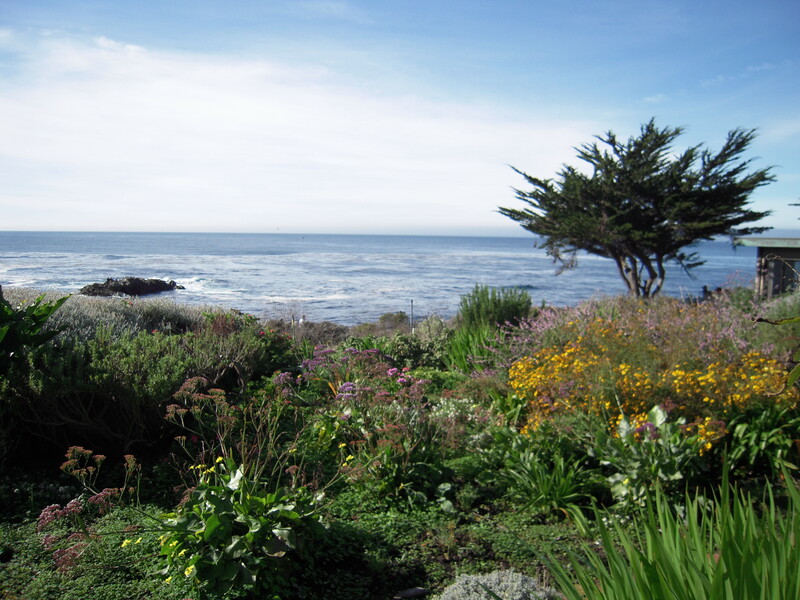 Because I was in vacation mode with people I love and breathing that sweet N. California air, it didn't occur to me that it was an unbelievable claim for a place that limits tours to six at a time. I just thought it was a sign of our specialness. So imagine my surprise when I later found out that it was my father who crafted that little bit of fiction. He was pre-paying for us and suggested the "millionth customer" thing instead of the less exciting "your father already paid for your tickets." I'm not as cynical/jaded as I sometimes think I am, which was a nice discovery. 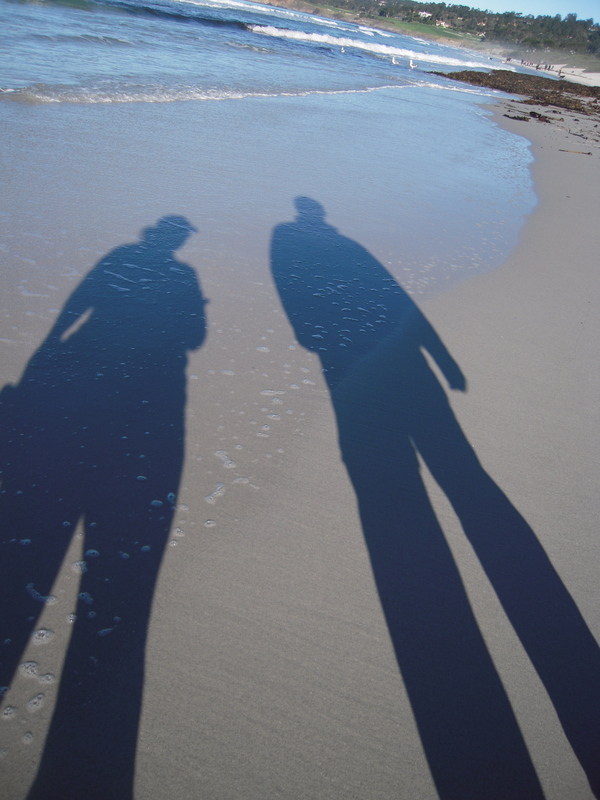 The blogger and James walking on the beach in Carmel. The town is VERY dog friendly (but not very kid friendly), so there are dogs everywhere - on the beach, on drivers' laps in cars, next to your table in a restaurant. I liked it because I love dogs, but it did make me miss my rat dog even more. Dametra Cafe, Carmel Warning: though the food was delicious and they have great presentation, they occasionally break into song and try to get you up from your table to dance with them. If you just want to get your eat/drink on, look elsewhere. We would have eaten there a second night had there not been a floor show. Candle Light Inn Located in the middle of downtown Carmel, Candle Light Inn is a delightful little place. They deliver a complimentary breakfast each morning in a small cooler – juice, yogurt, pastries, fruit, cereal – and each morning featured a different selection of goods. There’s also a big outdoor fireplace in the courtyard. We ran off a number of people with our nightly raucous conversation around that fire. the listing claims it’s “art deco” I don’t know about that, but I do know that this house mars the view from Tor House (it’s just to the left of the shot I posted above). A cool $19.2 million and it’s yours. 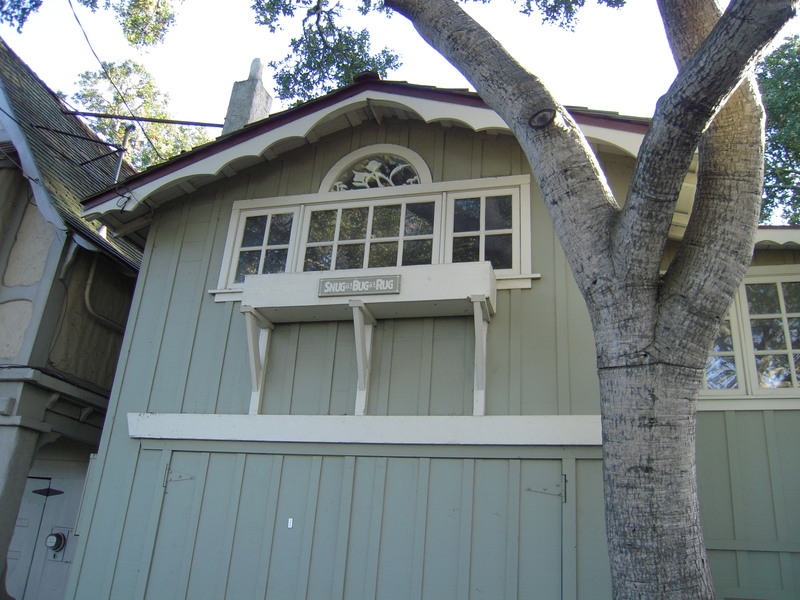 Please buy it and tear it down, or at least alter the roof line. It looks like it’s shooting the finger to the entire area. More like fart deco.